In an article published this month in Biblical Archaeology Review, Eilat Mazar claims that she may have discovered “a seal impression of Isaiah the prophet, adviser to King Hezekiah”. The discovery was made from wet-sifted material originally uncovered from outside the building at Ophel, Jerusalem in 2009, within an archaeological layer dated ca. 700 BCE. In the interest of the full disclosure of provenance, I note that the excavations have been taking place behind the 1949 Green Line, so are illegal in terms of international law. 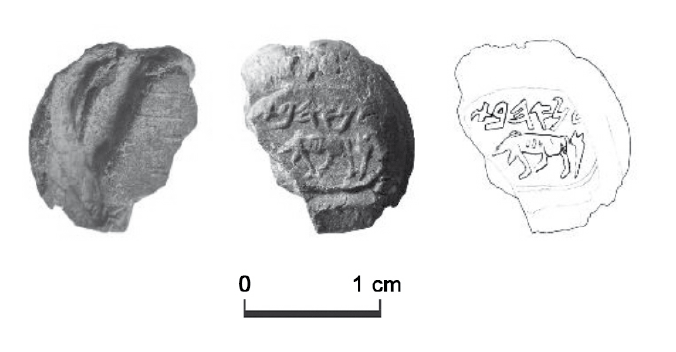 In her BAR article, Eilat Mazar expresses some caution in identifying the “Isaiah” of the seal impression (‘bulla’) with Isaiah the Prophet. The top line of writing clearly reads “leyesha‘yah[u]” (Hebrew: לישעיה[ו]; [belonging] “to Isaiah”). But there is more debate about the bottom line, on which the letters n-b-y are fairly clear. This would usually be the place for writing the name of the father of ‘Isaiah’. So we would expect usually that the seal would read ‘Isaiah [son of ] Nobai’. The word bn (“son of”) is often not included in seals from this period, so its absence here does not give us any reason to doubt that Nobai is the patronymic (‘father’s name’). Given the break on the left-hand side of the bulla (the end of each line), it is unclear whether there were originally further letters at the end. Mazar believes that there was a vav (ו) at the end of Isaiah’s name, which is plausible given the biblical spelling. Mazar also contends that there was an aleph at the end of nby, forming the title “prophet” or nby’ (נביא), rather than the patronymic Nobai. Yet there is no aleph or part-aleph visible at the end of the second line. By inserting a hypothetical missing letter, Mazar creates the reading “Isaiah the prophet”, i.e., the biblical prophet. 1. As pointed out by Christopher Rollston, George Athas, and Jim Davila, the spelling of “prophet” with the ‘y’ marking a long vowel (not a consonant) would be very rare at this time. You would expect the Hebrew term for “prophet” to be spelled n-b-‘ (with an aleph on the end, and with no yod at all). In later examples of letters from Lachish (3.20; 16.5), this is exactly what we get for the description of a son of a prophet: n-b-‘. 2. You would expect the definite article he to be prefixed to n-b-y if it spelled n-b-y[-‘]. Where the occupation of a person appears on an extant bulla, it always prefixed with the letter he, meaning “the prophet” or “the baker” or “the priest”, etc. In fact, Mazar acknowledges this: “no seals or bullae with single-word titles such as “prophet” (nvy’), “scribe” (spr), or “priest” (khn) that lack the definite Hebrew article “h” at the beginning are known from excavations or private collections” (Eilat Mazar). As can be seen in her drawing above, Mazar tries to squeeze a he in at the end of the first line. But there is clearly no room on the seal impression for a he after a vav. 3. The word n-b-y already makes sense, without suggesting that there are other letters on the end. As I noted earlier, lyš‘yh[u] nby would usually be translated as the patronymic “Isaiah [son of] Nobai”. It could, alternatively, mean “Isaiah the Nob-ite”, a resident of the hill of Nob, 2km away within Jerusalem – but again, usually with the definite article, he. Rollston lists other options, none of which require inserting (as Mazar does) an extra letter. 4. The same icon at the top of the seal was probably used by another ‘son of Nobai’. 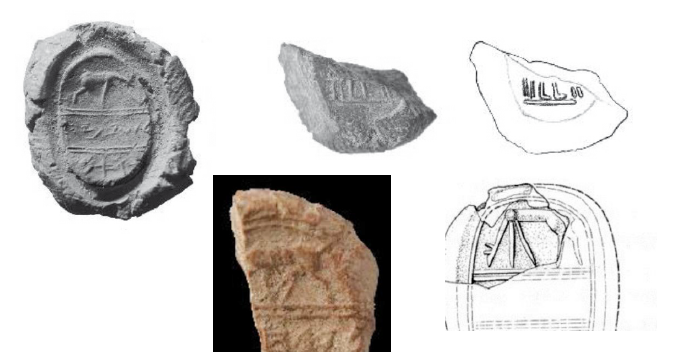 Eilat Mazar has oddly identified the icon (picture) at the top of the bulla as “the lower part of a grazing doe”. What is odd about this identification is that the ‘hind legs’ would be much thicker than the front legs. 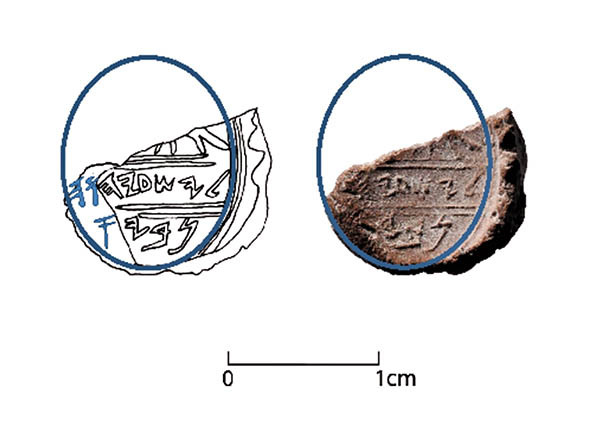 Mazar bases this identification on an icon of a grazing doe on a bulla found in her excavation of the so-called City of David (Mazar and Levyatan, “Hebrew and Non-Indicative Bullae”, 2015). I am obliged to note that this excavation, too, is illegal under international law, as it took place in occupied Palestinian territory. No, the alleged ‘hind legs” look a whole lot more like a bird’s tail-feathers, of which there are many examples on Hebrew bullae. Despite the fragmented state of the Isaiah bulla, the bird, probably either a pigeon or dove, appears to be the same in each case. The bulla on the right is from the A. Spaer collection, and despite difficulties in provenance, also dates to ca. 700 BCE, and is also purportedly from Jerusalem. And they share the same patronymic, “Nobai”. The bulla above, on the right (bulla #693 in Avigad & Sass) has the name “‘Oreb [son of ] Nobai”. Very similarly, the Isaiah Bulla has “Isaiah [son of] Nobai”. Both bullae therefore have the same bird and patronymic combination. It may even be the exact same bird, a dove or pigeon, and therefore a family icon. We could well have two brothers, sons of the same Nobai (although, I wouldn’t want to speculate). Therefore, given the evidence of Bulla #693, the better conclusion is that the ‘Isaiah’ of the Isaiah bulla is “Isaiah [son of] Nobai”, possibly a brother of “‘Oreb [son of] Nobai”, and not “Isaiah the prophet”. Mazar may well counter that she only mooted the possibility that the Isaiah bulla refers to the biblical prophet Isaiah. But as Christopher Rollston points out in “An Ancient Medium in the Modern Media: Sagas of Semitic Inscriptions”, scholars are responsible when they encourage sensationalist media reporting – which can remain in the public mind long after scholars have had the time to counter it. And already, several news outlets have misidentified the ‘Isaiah’ of the Isaiah bulla with Isaiah the prophet, both with and without qualifying that this was only a possibility: e.g., The Times of Israel, Jerusalem Post, Newsweek, National Geographic, Fox News, The Daily Mail, and the National Post. Good insights. This is definitely not going to help anyone. Mazar might have been caught up a bit in her previous years of groundbreaking biblically related finds. Interestingly, this scientific excavation produces the most unscientific hallucinate results possible !! !